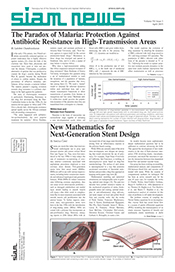 SIAM News, the newsjournal of the Society for Industrial and Applied Mathematics (SIAM), covers cutting-edge research and the state of the art in applied mathematics and computational science. Reporting on novel applications of mathematics and new uses of mathematical methods in numerous areas from medicine to climate modeling, SIAM News is intended for both SIAM members and the overall community served by SIAM. Broader and less technical articles may appeal to general readers with an interest in the mathematical sciences. SIAM News also details areas related to science policy, professional development, mathematics education, and trends in the discipline, all of which are bound to be of interest to educators, policy makers, and those in regulatory and administrative roles. Suggestions for articles or stories should be addressed to: Karthika Swamy Cohen, managing editor (karthika@siam.org). Letters to the editor are welcome. Suggestions for articles or posts for the SIAM News Blog can be sent to sinews@siam.org. Copyright 2016, all rights reserved by the Society for Industrial and Applied Mathematics, SIAM, 3600 Market Street, 6th Floor, Philadelphia, PA 19104-2688; (215)382-9800; siam@siam.org. The material published is not endorsed by SIAM, nor is it intended to reflect SIAM’s opinion. The editors reserve the right to select and edit all materials submitted for publication. Advertising Information. For all advertising rates and information, contact Kristin O’Neill at marketing@siam.org, or visit http://www.siam.org/advertising/news/. Subscription Information. For a subscription to the print edition, mailed 10 times per year, see http://www.siam.org/news/subscribe.php.